Each week, ResQwalk announces a donation pool (e.g. $2,500). In order for a rescue to receive donations from the pool, its supporters simply need to check into the app when they go for a walk (with a dog, alone, or with a friend). What else does ResQwalk do? Other cool features of the app include: prizes at the end of each walk, a news section with pet-related content, a shop section with product deals and offers, and profile pages for users and rescues to track both miles walked and dollars raised. Information pulled from ResQwalk's Indiegogo campaign website and their FAQ Page on their website. Simply download the app, select Reservation Animal Rescue™ (RAR), and start walking! Does it cost anything to ResQwalk? No! ResQwalk is free for users and RAR. No. You can participate in any distance-related activity (walking, running, biking) as long as it can be measured by GPS and involves a speed of less than 14 MPH. Yes. ResQwalk limits users to 30 miles per day — enough for a marathon and stretch! How does the app know how far I've done? ResQwalk uses GPS to track your movement. The app doesn't seem to be tracking my distance correctly. What can I do? Please wait to press 'Start Walk' until you are outside of your home. GPS works best when there are minimal obstructions. Second, if you are iOS user, make sure 'Background App Refresh' is on. Does GPS consume data on my phone? No. GPS does not use data. The other app features, such as upload a photo, do use data. If you are concerned about your data usage, please be sure to connect to Wi-Fi when uploading photos and/or interacting with features such as the News Feed and Leaderboard. Is ResQwalk compatible with stationery bikes, treadmills, Fitbit, Apple Watch, etc.? No, but this is something ResQwalk is working on! I just went on a ResQwalk and my stats aren't updating... What do I do? ResQwalk updates user stats and the leaderboard hourly. If you don't see your stats immediately, simply check back later. For more FAQ's, please visit the ResQwalk FAQ page. If you don't find what you are looking for, please email webmaster@nativepartnership.org and we will try to answer your question as soon as possible. 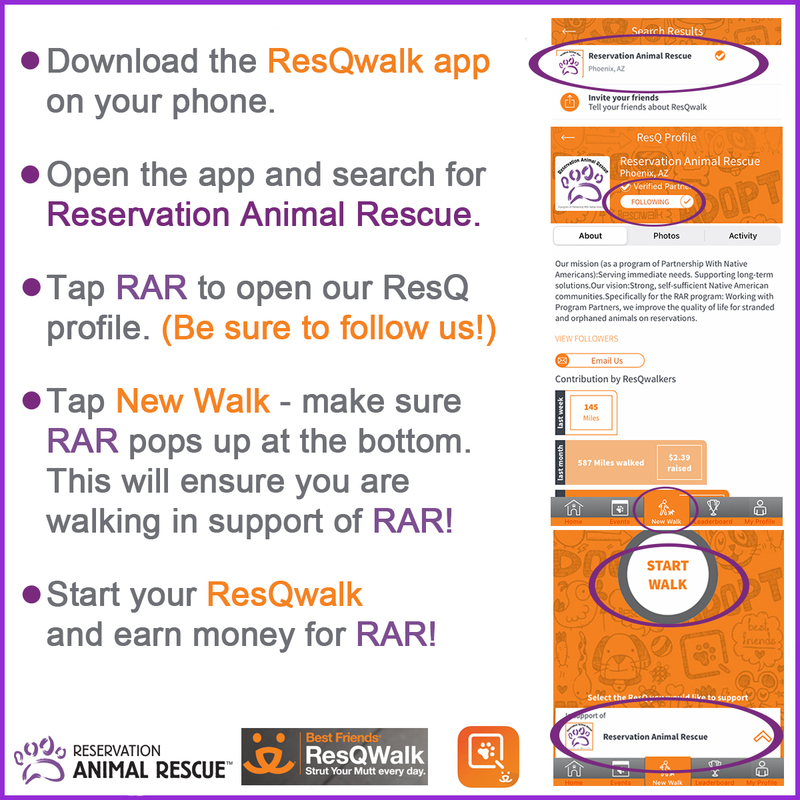 If you would rather make a donation to RAR than use the ResQwalk app, you may do so here — DONATE.